Our qiblah is the Kaabah. HOW DO I KNOW THAT THE KAABAH IS THE QIBLAH? Allah says in the Quran that our Qiblah is the masjidil Haram that is the Kaabah in Makkah. Kaabah is in Makkah, Saudi Arabia. Point where Qtar is and mark it. Draw a straight line (use a ruler) from Qtar to Makkah. Then point to Malaysia . And make another straight line to Makkah. Then talk about how Muslims around the world face the same qiblah when they pray. Draw straight lines and arrow indicating the direction from the respective countries to Makkah. Insya Allah they will get the point. The children, including Z were most excited doing this exercise. It’s a practice of knowing the orientation of a country. And they were racing each other to find a country mentioned. Use the qiblah compass to show them how to find the qiblah when we are at a new place. Get them to read the coordinate points of different countries and how to use the values to find the qiblah. This is a very useful gadget to have especially when we travel. Introducing the concept of North, East, West and South. Remind them where does the sun rise? Where does the sun set? If we are outside, in the dunes for example, and we do not have the Qiblah compass, and come prayer time (Remember solah is compulsory wherever we are! ), how do we gauge where the direction is? First look at the map. Look at the location of Makah in relative to Doha. 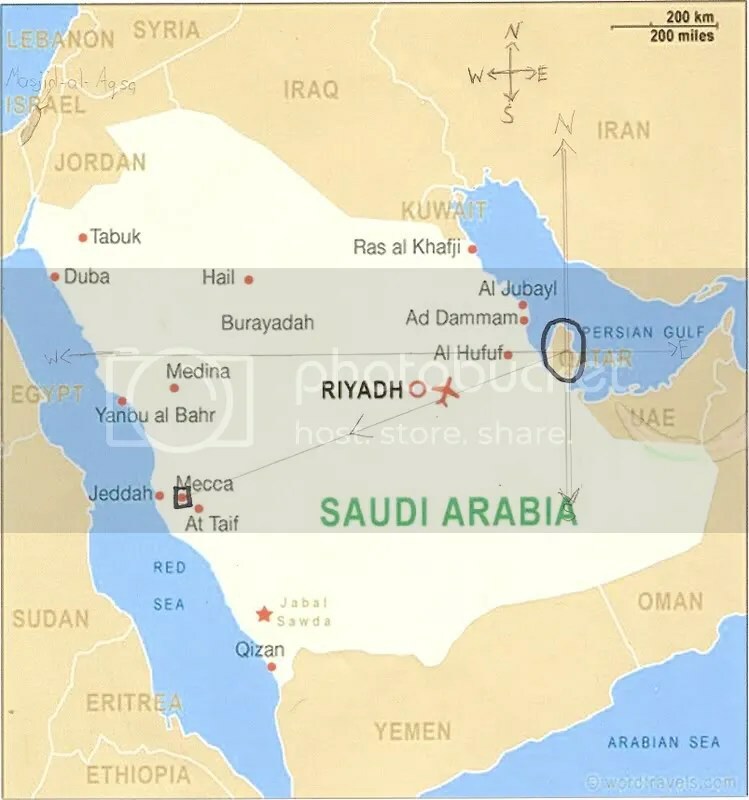 Makkah is approximately South West from D0ha. We must always be aware of our our position on earth relative to Makkah. DO YOU KNOW THAT THE KAABAH HAS NOT ALWAYS BEEN OUR QIBLAH? When Mohammad s.a.w. became prophet he prayed towards Bayt Al Maqdis. Nearly all my notes here are taken from TALIBEDEEN JR. May Allah reward her for her great work. Masya Allah. Cross referenced with the book The concise presentation of the Fiqh – Dr. Abdul Azeem Badawi. A Description of Prophet’s SAW Prayer : Shaikh Muhammad Naasir ud Deen Albaani. Translated by Usama Ibn Suhaib Hasan. Our Qiblah did not start off with the Kaabah. It was the Bayt Al-Maqdis (Jerusalem) first then Allah change it to Kaabah. First look for Jerusalem on the map. Draw a line from Makkah to Jerusalem. This map will help explain the orientation of Jerusalem relative to Makkah and also the orientation of Madinah. Prophet Muhammad when he was praying in his years in Makkah, he used to pray facing the Kaabah but towards Jurusalem, bayt Al-Maqdis. When he made hijrah, he pray also to Bayt Al Maqdis but he had to back the Kaabah. Muhammad s.a.w. had wished that he would face the Kaabah, the Qiblah of Ibrahim, again. Prophet Muhammad used to supplicate to Allah and look at the sky, waiting for Allah’s command. (Tafsir Ibn Kathir). He was keen on the change but dared not request. The Jews also used the fact that Muslims adopted their own holy city (Jews consider Jurusalem to be their holy city) as their qiblah to claim that Judaism was the religion of truth and that Muhammad and his companions adopt Judaism, instead of calling on the Jews to accept Islam. Then Allah revealed ayah Al Baqarah 2:144. The Prophet prayed facing Bait-ulmaqdis (i.e. Jerusalem) for sixteen or seventeen months but he wished that his Qibla would be the Ka’ba (at Mecca). (So Allah Revealed (2.144) and he offered ‘Asr prayers(in his Mosque facing Ka’ba at Mecca) and some people prayed with him. A man from among those who had prayed with him, went out and passed by some people offering prayer in another mosque, and they were in the state of bowing. He said, “I, (swearing by Allah,) testify that I have prayed with the Prophet facing Mecca.” Hearing that, they turned their faces to the Ka’ba while they were still bowing. The Jews in Madinah countered with a sustained campaign of criticism. Their new campaign sought to create doubts in the minds of Muslims as to the basis of their own religion. If it was right, the Jews argued, that the Muslims should formerly face Jerusalem in their Prayers, then the new direction is wrong. The Jews also argued that God, the Lord Who knows all, does not change His instructions in that manner. The change clearly showed, the Jews went on, that Muhammad did not really receive any revelation from God. Reassurance was needed and was, indeed, provided in a long passage in the Quran, which runs from verse 106 to verse 150 in the surah entitled Al-Baqarah. Also in the same hadith as the above.. The change of Qiblah is a test for those who believe. the Arabs, even though they were pagans before Islam, still perform traditional prayer ritual towards the Kaabah. Unfortunately mostly have taken up to worshiping idols. Kaabah is highly revered among the Arabs. It is a symbol of national glory. It is a factor that pull all the Arab tribes together. Thus it was a test of true submission towards Allah when they were asked to pray towards Jerusalem initially. The sahabahs need to abandon former loyalties and tribal racial. hence the need to separate worship from traditional practice of the Kaabah. The revelation to change the qiblah was sent down when Mohammad saw was in a masjid now called Masjid Qiblatain, meaning the masjid of two qiblahs. Masjid al Qiblatain (or the Mosque with two Qiblas), is situated in Madinah, a few kilometres from Masjid an-Nabi. It is one of the oldest Mosques in the world, and uniquely contains thus two mihrabs – one in the direction of bait al-Maqdis (Jerusalem), and the other towards Makkah. This story might be heavy for the younger children. These notes are only for my guideline. Like any story, narrate them according to their level. For S (who is seven), I only told her that our qiblah used to be facing the masjidil Aqsa, I showed her a picture of the sacred mosque and shoqed her on the map where Jerusalem is. I tell a bit more to H (he is ten). But did tell him in a simplified manner that the directions are a test to the early muslims.